No surprise that Google's "doodled pink" and celebrates Audrey Hepburn’s 85th with a simple, classical, stylish pink doodle. Cropped hair-dos, gracious greecian up-dos, plain pony-tails and French twists, over-done eyelashes, natural eyelashes, over-outlined eyebrows, bushy eyebrows, plain pink lipsticks, dark red lipsticks, pencil-straight pants, wide-legged pants, bold-striped Tees, button-down shirts, ruffled blouses, strapless, turtleneck, you name it, Hepburn's glamorized and signatured it. Any make-up she'd smudge on or apparel she'd wear would become the latest fad. Hepburn was classic yet broke many rules from over-sized, overdone, stylizing menswear glorifying pinstripe suits, bow-ties and penny-loafers. Hepburn transformed a simple "little black dress" into elegance and stunning formal wear into fashion statements. 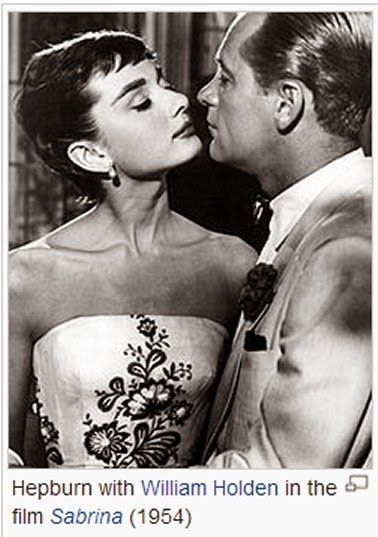 Hepburn's beauty will always be ageless and her iconic style always timeless. 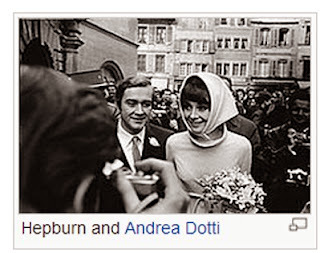 Surprisingly, according to an April 2013 Vanity Fair article, according to her son, Luca Dotti, Hepburn never thought she was beautiful. 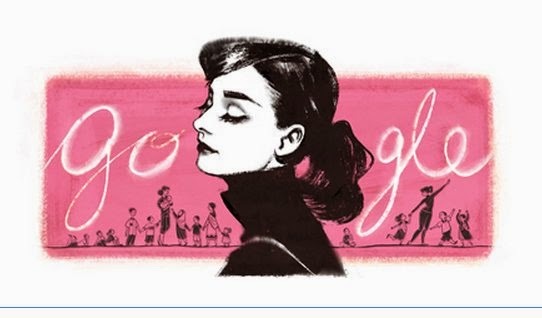 Born in 48 Rue Keyenveld, Ixelles, Brussels, Belgium, Hepburn spent her childhood between Belgium, England and the Netherlands, including German-occupied Arnhem during the Second World War. Her father, Joseph Victor Anthony Ruston (1889–1980), was a British subject born in Úžice, Bohemia, to Anna Ruston née Wels of Austrian descent and Victor John George Ruston of British and Austrian descent. A one-time honorary British consul in the Dutch East Indies, Ruston had earlier been married to Cornelia Bisschop, a Dutch heiress. Although born Ruston, he later double-barrelled the surname to the more "aristocratic" Hepburn-Ruston, mistakenly believing himself descended from James Hepburn, third husband of Mary, Queen of Scots. Her mother, Baroness Ella van Heemstra (1900–1984), was a Dutch aristocrat and the daughter of Baron Aarnoud van Heemstra, who was mayor of Arnhem from 1910 to 1920 and served as Governor of Suriname from 1921 to 1928. Ella's mother was Elbrig Willemine Henriette, Baroness van Asbeck (1873–1939), who was a granddaughter of jurist Dirk van Hogendorp. The family often travelled between the three countries due to her mother's family in the Netherlands and her father's British background and job with a British company. With her multinational background, she went on to speak fluent English, Dutch, French, Spanish and Italian. 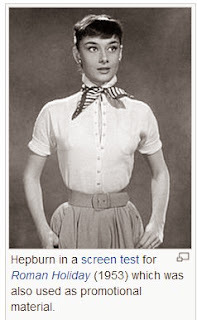 Hepburn participated in ballet by the age of 5. In Amsterdam, she studied ballet with Sonia Gaskell before moving to London in 1948 to continue her ballet training with Marie Rambert and perform as a chorus girl in West End musical theatre productions. She spoke several languages including English, French, Dutch, Italian, Spanish, and German. After appearing in several British films and starring in the 1951 Broadway play Gigi, Hepburn played the Academy Award-winning lead role in Roman Holiday (1953). 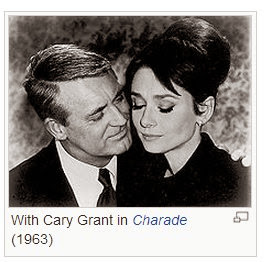 She went on to star in a number of successful films, such as Sabrina (1954), The Nun's Story (1959), Breakfast at Tiffany's (1961), Charade (1963), My Fair Lady (1964) and Wait Until Dark (1967), for which she received Academy Award, Golden Globe and BAFTA nominations. For her role in Roman Holiday, Hepburn was also the first actress to win an Oscar, a Golden Globe and a BAFTA Award for a single performance in 1954. The same year, she won a Tony Award for Best Lead Actress in a Play for Ondine. 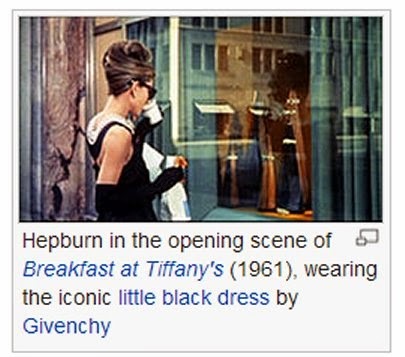 Hepburn remains one of few people who have won Academy, Emmy, Grammy, and Tony Awards. She won a record three BAFTA Awards for Best British Actress in a Leading Role. She appeared in fewer films as her life went on, devoting much of her later life to UNICEF. Although contributing to the organization since 1954, she worked in some of the most profoundly disadvantaged communities of Africa, South America and Asia between 1988 and 1992. She was awarded the Presidential Medal of Freedom in recognition of her work as a UNICEF Goodwill Ambassador in December 1992. 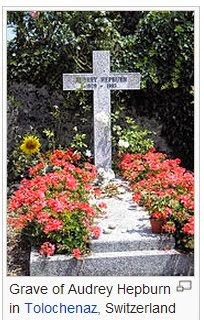 A month later, Hepburn died of appendiceal cancer at her home in Switzerland at the age of 63. Photos courtesy of Wikimedia.org unless otherwise indicated.